handcraft nature's bounty into quality artisan cheese. They have a wide variety of cheese curds, brie, and cheddar blocks made from pasteurized locally produced cow's milk. All natural ingredients are used in the flavouring process as well. Book an onsite tour today! Red Feather Ridge, named for the red tailed hawks that soar over the Grizzly Bear Coulee, is a rustic, yet sophisticated retreat and conference centre. It is set in a beautiful location and is the perfect venue for weddings, anniversaries, reunions with a 160 seat dining room, meeting and breakout room, and lounge area with fireplace. There is also an unserviced camping area for guests. The Vermilion River Region hosts many professional events each summer, including the Professional Bull Riding in Marwayne on April 7, the Lea Park Rodeo on June 8-10 north of Marwayne, CPCA Chuckwagon Racing in Dewberry on June 15-17, and several fairs that highlight the region's agricultural and western roots. OUTDOORS For a quiet afternoon, take a trip south of Highway 16 to picnic and bird-watch at Lindsay Evans Park. There are five golf courses throughout the County of Vermilion River to challenge golfers of all skill levels. In winter, Mount Joy Snow Resort (mountjoy.ca), southeast of Kitscoty, offers downhill skiing and snowboarding. There's no better place in the area to learn to ski or snowboard. Take to the hill with their eager and friendly volunteers who will have you carving the slopes like a pro! Kitscoty Located at the junction of Highways 16 and 897 is the village of Kitscoty. Kitscoty is named after a famous cromlech, or burial chamber — three large stones in a tripod arrangement — found near a settlement in England known as Kits’ Coty House. ATTRACTIONS & EVENTS The Kitscoty Community Hall is equipped with a separate banquet and conference rooms, and is available for weddings, dinner theatres, or any large event. Celebrate Canada Day during the Celebrate Kitscoty event on June 30-July 1. 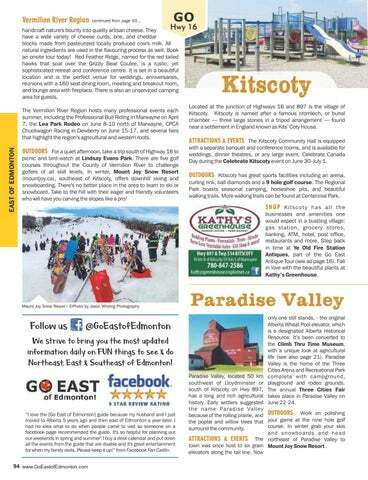 OUTDOORS Kitscoty has great sports facilities including an arena, curling rink, ball diamonds and a 9 hole golf course. The Regional Park boasts seasonal camping, horseshoe pits, and beautiful walking trails. More walking trails can be found at Centennial Park. SHOP Kitscoty has all the businesses and amenities one would expect in a bustling village: gas station, grocery stores, banking, ATM, hotel, post office, restaurants and more. Step back in time at Ye Old Fire Station Antiques, part of the Go East Antique Tour (see ad page 16). Fall in love with the beautiful plants at Kathy’s Greenhouse. 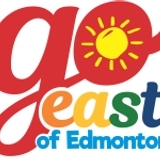 “I love the [Go East of Edmonton] guide because my husband and I just moved to Alberta 5 years ago and then east of Edmonton a year later. I had no idea what to do when people came to visit so someone on a facebook page recommended the guide. It's so helpful for planning out our weekends in spring and summer! I buy a desk calendar and put down all the events from the guide that are doable and it's great entertainment for when my family visits. Please keep it up!” from Facebook Fan Caitlin. Paradise Valley only one still stands, - the original Alberta Wheat Pool elevator, which is a designated Alberta Historical Resource. It’s been converted to the Climb Thru Time Museum, with a unique look at agricultural life (see also page 21). Paradise Valley is the home of the Three Cities Arena and Recreational Park complete with campground, playground and rodeo grounds. The annual Three Cities Fair takes place in Paradise Valley on June 22-24.